In the race to control agriculture from the roots up, whoever wields economic, legal and technical control over the genetics of living things will exert considerable power. Early advantages in genetic engineering enabled companies such as Monsanto to reshape seed and build a new business model around it. They succeeded in making the cultivation of millions of hectares dependent on their proprietary seeds and chemicals. The techniques of that first "transgenic" generation now appear crude compared to a new set of tools that directly edit the DNA building-blocks of life. Agribusiness giants are positioning themselves to prosper from the new technologies. Control over tomorrow's agricultural landscape starts with big data, using very large datasets to reveal patterns, trends and associations. 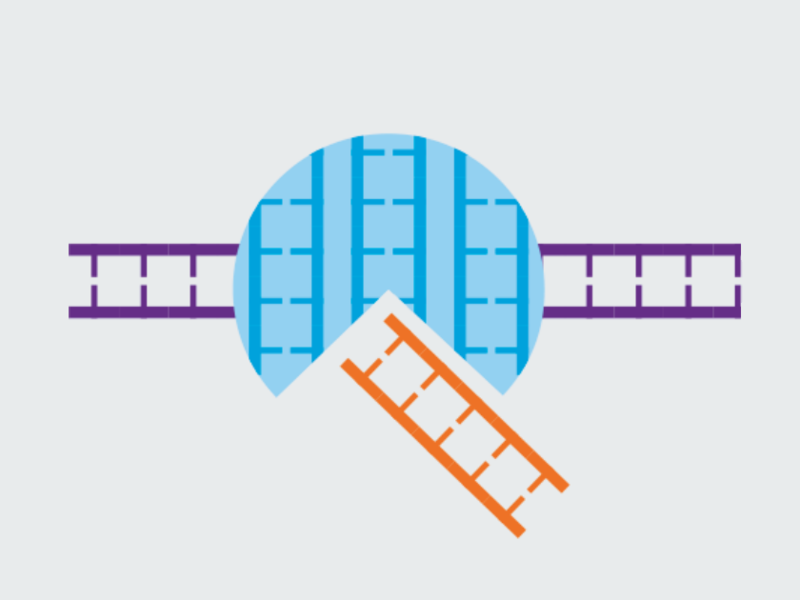 Over 1,000 research centres are generating data on genome sequences at a breakneck speed. By 2025, we will have more data on genomics than on astronomy. The resulting exabytes of data are often housed in open, public databases that are only accessible to companies with the costly bioinformatics capacity needed to tap into their potential value. They use special algorithms and artificial intelligence to pinpoint gene sequences that may be of interest. The hosts of these genome databases naturally understand the treasure trove they are amassing on the industry's behalf – succumbing to the temptation, one public database, Divseek, which collects data on the genomic diversity in agricultural species, was recently caught trying to sell privileged access to data to Syngenta and DuPont. This would have given these agrochemical giants an inside track to patenting modified genes that confer traits desired by customers. The biotech majors are actively seeking so-called "climate genes": they want to digitize the DNA sequences thought to be responsible for a plant's ability to handle environmental stresses such as flooding and drought. In a warming, changing world, owning the rights to a plant's ability to adapt is a far-sighted strategy. If a crop must be "climate-ready" to survive or to thrive, then those who own the relevant traits also control the viability of industrial agriculture. In 2010, there were 262 "patent families" (over 1,600 patent documents) claiming rights to "climate genes". Two-thirds of these were claimed by three companies: Monsanto, BASF and DuPont. The agribusiness giants hope one day to combine climate-targeted seeds with precision planting and sensing systems. Farmers would purchase seeds genetically modified for their specific field conditions, and the machines would sow and fertilize them accordingly. This vision is now driving mega-mergers in the pesticide and seed sectors. Another wave of mergers between agri-input firms and farm machinery manufacturers is on the horizon. The US tractor maker John Deere has already signed deals with the agrochemicals giants Syngenta, Dow and Bayer to develop the equipment needed for digitized farming. Identifying (and patenting) the key gene sequences for the future of agriculture is one thing, incorporating sequences into living crops is another. The big news in genetics is not so much reading genomes as the ability to write and rewrite DNA. A growing list of genetic engineering techniques based on fast, flexible "gene-editing" and synthesis of DNA promise that the DNA codes of crops, animals and microbes can now be easily reshaped using digital and laboratory tools. DNA synthesis, the ability to "print" new strands of artificial DNA, is now going to become a bulk business. In 2016, approximately one billion base pairs of synthetic DNA were manufactured by a small number of companies, including Life Technologies, Twist Bioscience, Gen 9, IT-DNA and GenScript. However, software giants may become power players in this field: Autodesk, known for its technical design software for engineers and architects, is driving a high-profile project, known as GP-Write, to synthesize genomes. Microsoft and Intel are also investing in synthetic biology. A fierce battle is being fought over the ownership of new tools that do the genetic engineering. An early gene-editing toolset known as zinc finger nucleases (ZFN) was patented by Sangamo BioSciences, a company in California, and exclusively licensed for crop engineering to Dow Chemical, a company that is now merging with DuPont. Another tool, called TALEN (Transcription Activator-like Effector Nucleases), was mostly patented by France-based Cellectis and licensed to Bayer and Syngenta. The technique drawing most attention is CRISPR (Clustered Regularly Interspaced Palindromic Repeats). Two rival teams of inventors are fighting over the patent rights, with billions of dollars riding on the outcome. 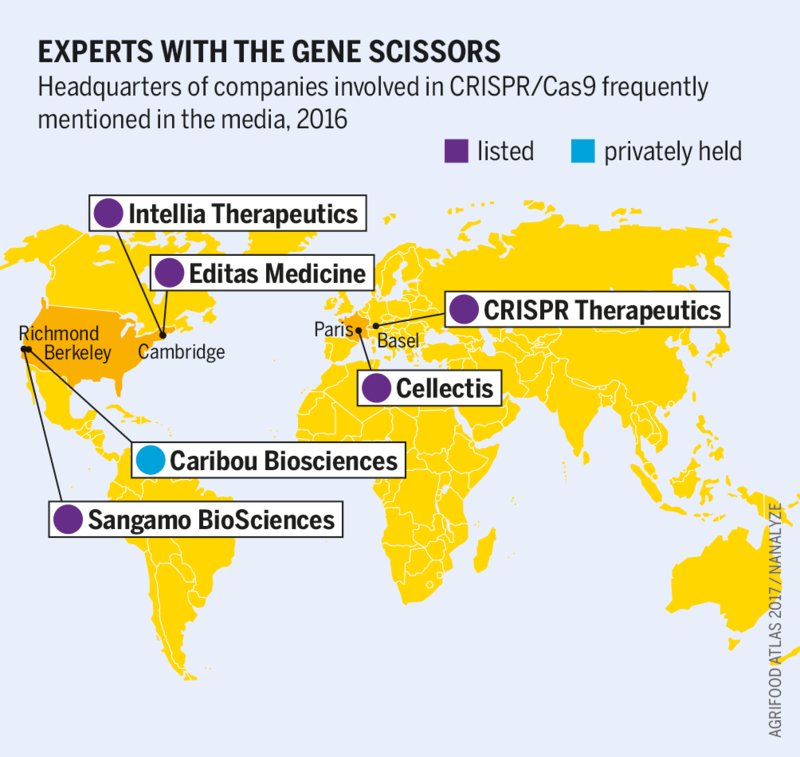 On one side are Emmanuelle Charpentier, a French microbiologist working in Germany, and Jennifer Doudna, an American from Berkeley University who co-founded Caribou Biosciences. They have licensed the use of CRISPR in crops to DuPont. On the other side, Feng Zhang of the Broad Institute, a biomedical research centre associated with MIT and Harvard University in Cambridge, Massachusetts, has granted a CRISPR license to Monsanto. Meanwhile, Cellectis claims that its gene-editing patents may pre-empt both sides – perhaps putting their partner Bayer in a key position. Both Monsanto and DuPont intend to bring CRISPR-edited crops to market by 2021. US regulators have already confirmed that two early CRISPR crops, a type of mushroom and one of maize, are not even subject to regulation. 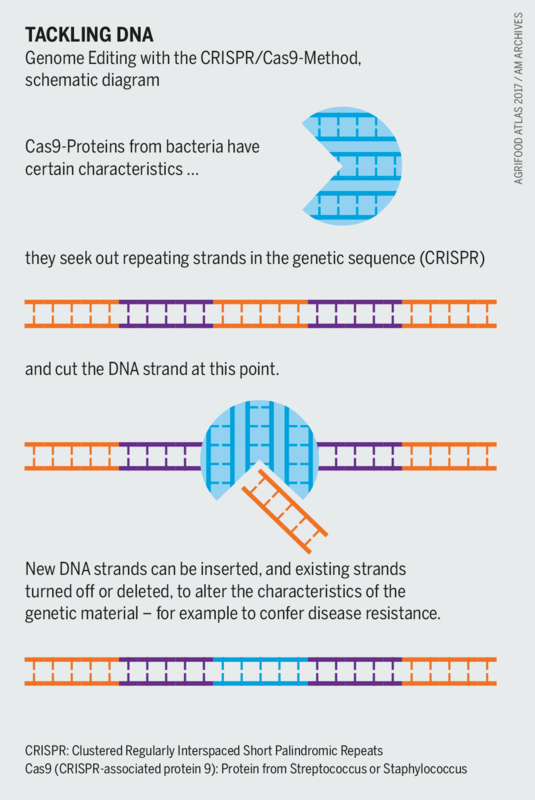 This decision has given CRISPR a boost. Lawyers for biotech firms have convinced some governments to approve the use of organisms modified using this technique, and to dispense with requirements that they be labelled as such. A gene-edited herbicide-tolerant canola variety, developed by the Californian company Cibus Biotech, is being grown by US farmers and has entered the global supply chain. It is marked as "non-transgenic" and even as "not genetically modified", because it contains no genes introduced from other organisms. This is a dream scenario for biotech firms, in which they can bring new, genetically modified crops to market, without regulation or labelling while still enjoying patent protection and garnering higher prices because they are supposedly not genetically manipulated. Officials no longer demand time-consuming tests to uncover risks or debates about their significance. In other words, biotech firms can not only edit the genome; they can also edit out the precautionary principle and public opposition in politics.